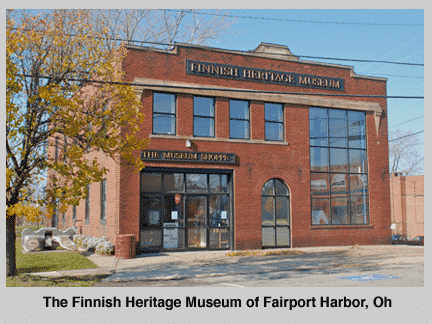 We are proud to support the local Finnish Heritage Museum in Fairport, Ohio. The museum is located on the corner of High and Third Streets in downtown Fairport Harbor, Ohio just two blocks from Lake Erie and one block from the Finnish Monument. The building served the village for years in various public service capacities and until recently operated as the Fairport Harbor Senior Citizen’s Center. The structure is slated for extensive repairs and remodeling in order to accommodate our museum exhibition galleries, library, workrooms and office areas. The building has existed since 1922-23 and has served Fairport Harbor well as a Police Station complete with a single “holding” jail cell in the back, as a volunteer Fire Department with kitchen and firemen’s quarters, and a Village Hall meeting room for monthly meetings. The picture shows the Museum as it appeared in 2007.